Ron Brownstein, one of the country’s most astute political reporters, writes in the September 19 National Journal the recent Democratic surge in several western states may be receding. Former Lt. Governor Jane Norton, who entered the Republican primary the third week of September, became the Republican Party’s frontrunner, and in head-to-head comparisons with Democratic Senator Michael Bennet, she leads Bennet by 9 points. Former Democratic Speaker of the Colorado State House, Andrew Romanoff, who entered the race in mid-September, loses to Norton by 8 points. Norton’s lead is primarily based on a 30-point advantage among unaffiliated voters, which can only be based on a preference for a Republican and some advantage of the well-known name of Norton in Colorado politics (including former Colorado Attorney General and Secretary of the Interior Gail Norton and former gubernatorial candidate and Transportation Department Director Tom Norton. There are several other Nortons known in Colorado political circles). Norton and Romanoff’s entry in the race launches the 2010 election, and makes Colorado a battleground. Floyd Ciruli, my father, dropped out of the 4th grade of Pleasant View Grade School in Pueblo County. He was always very proud he could read the Pueblo Chieftain and do basic numbers for his business, Ciruli Oil. I graduated from law school, representing a total of 19 years of formal education, plus numerous graduate classes for various purposes. The Cirulis weren’t unique. Although my father was in the 4th grade in 1910, even by 1940, 75 percent of adults were high school drop outs (or never made it) and only 5 percent graduated with a 4-year college degree. In 2007, only 14 percent of the population lacked a high school diploma and 29 percent have a 4-year college degree or higher (54 percent, or half the population, have a degree or some college education). Although we endlessly want to lower our drop out rate and improve our college graduation rate, we need to recognize how far we have come in mass high school and college education in a couple of generations and half a century. After eight months and in the midst of the Democratic Party’s crack-up over health care, newly appointed Senator Michael Bennet has some assets, but a rapidly growing array of liabilities. On the asset side, Bennet has shown himself to be smart, hard working and with an organized campaign team whose biggest success has been fundraising (more than $3 million in two quarters). On the liability side, Bennet is poorly known and now suffering from the blues associated with congress and Washington. The latest circulated Colorado poll shows Bennet with a 9 point deficit in voter approval over disapproval and only 31 percent of voters approving his performance. Bennet was, of course, hoping to use that surfeit of money to create an image of moderate leadership against a still unimpressive Republican field. Unfortunately, one of the state’s most visible underemployed Democrats, Andrew Romanoff, will challenge him. Now, Bennet will have to spend some of that money defending himself this winter and spring. The race is hard to handicap today, but if Romanoff is ready for a real fight, he has some advantages as the non-establishment candidate, dissed by unpopular Governor Bill Ritter and with a decent claim to party support for years of legislative and ballot issue leadership. Like the hot, slow days of summer, Colorado’s top politicians are suffering from the heat. They are failing to break the 50 percent barrier in approval. President Barack Obama is the state’s most popular Democrat, a reverse from former President G.W. 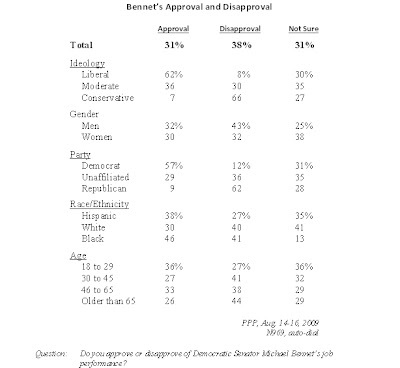 Bush’s low level of approval compared to statewide Republicans in 2006 to 2008. But, even Obama has been below 50 percent for four months. His national polling numbers, which were in the 60 percent range most of the spring, have caught up to Colorado’s and are now at the low 50 percent level. In the latest published auto-dial poll, Governor Bill Ritter and his choice for U.S. Senate, Michael Bennet, are at or below 40 percent in voter approval, and both are vulnerable in the 2010 election if the state’s Republicans can find strong candidates. Voters tend to know less about their senators and associate them with partisan problems in Washington. Even Senator Mark Udall had low numbers in the August survey. However, Bennet is especially endangered with 7 percent more disapproval than approval and 31 percent of voters with no awareness of him. And, along with having to deal with hyper partisan issues like health care reform and cap and trade, Bennet can no longer depend on Obama’s popularity to pull the electorate in the Democratic direction. There is at least some doubt as to usefulness of Obama’s grassroots organization. Because, although it shows up on command to pressure Democrats to stay liberal on issues like health care, it may not represent a lot of 2010 election day enthusiasm. Fortunately for Bennet, he is the seated senator and can use the office to make his case; he has more than $2 million in campaign cash; and he has no high-profile, well-funded Republicans on the horizon. Unfortunately, as of September, he has a primary opponent, former Democratic Speaker of the House, Andrew Romanoff. As the health care debate finally heated up, Colorado voters were not on board. By 51 percents to 38 percent, they said they opposed the President’s plan in mid-August. National and Colorado voting data indicates the plan has lost the middle of the electorate (unaffiliated voters: 36% favor/48% oppose) while partisans, especially Republicans, are intensely positioned (Republicans 88% oppose/Democrats 73% favor). Compounding Obama’s and Democrats’ problem is the intensity liberals feel about the proposal (86% support) and key elements, such as the public option and even the sweeping single payer approach. In Colorado, both Senators Udall and Bennet have been accosted at public forums by intense Democrats and hostile Republicans.